Columbia Gramophone Company wished to release a recording of the most popular tunes from the opera, but Austin took a better offer from Colubmia's rival His Master's Voice, and recorded the arrangements for release through HMV. Columbia subsequently commissioned new arrangements of the same popular tunes to be made from the original 1729 publication, by composer and arranger Albert Ketèlbey, intending to create a competing recording which they assumed would be independent of Austin's arrangement and therefore free of any copyright restrictions. Ketèlbey went to the British Library and copied the same Gay original that Austin had used, but making, so he claimed, new, independent arrangements. In the end the HMV recording was completed first and its records made it to the shops about a week before Columbia's. The stage version of Polly was currently very successful at The Kingsway Theatre, and the records expected to benefit from the wave of popularity. After a three month run at the Kingsway (with a 650 capacity) the production transferred to The Savoy Theatre, which was twice the size. There it ran until October 1923, with over 300 performances. It is interesting that Austin took on the case himself, without naming his record company His Master's Voice or the print publisher Boosey & Co. as co-claimants, though it is possible that HMV supported the claim and offered to contribute towards costs. The trial reports in The Stage mention that Austin himself retained the copyright in his arrangement, and only licensed the print and dramatic rights to Boosey and another party respectively. The judge considered evidence from musicologists, which showed that Columbia’s arrangement had deliberately attempted to replicate the popular arrangement made by Austin. Even though they had not reproduced Austin’s harmonies note for note, they had “imitated his harmonisation to capture the impression made by his own music, on which the production’s commercial success was based” – effectively an attempt at passing off the arrangements as Austin’s. Austin illustrated the evidence by singing examples of the original Gay opera, and his altered versions of the same arias. He highlighted similarities in the harmonisation that he had brought to the original, and that of Ketèlbey, one of which he called a "bagpipe harmony". The counsel for the claimant brought in many expert musical witnesses - composers, conductors and professors of music, who testified that Austin had added a significant amount of new material to the original Gay melodies, and that Ketèlbey's arrangement had much in common with Austin's arrangement. It was highly unlikely that Ketèlbey's own arrangement could have been made without having seen or heard Austin's. An accidental error in Austin's vocal score of Polly named one of the airs "The Buss Coat" instead of "The Buff Coat". This error was reproduced in the Ketelbey version, and also in the advertisement for the HMV recordings of Ketèlbey's arrangement. Counsel for the defence submitted that the fact that Austin and Bax's arrangement of Polly was popular did not preclude others from arranging the same work. Ketèlbey denied copying Austin's treatment of the Gay original. He had used his own musical instinct, which had resulted in similar treatment, but different harmony. Mr Justice Astbury asked the defence if he could hear the two recordings in question, but counsel replied that they believed a hearing of the records would make the case harder to decide. 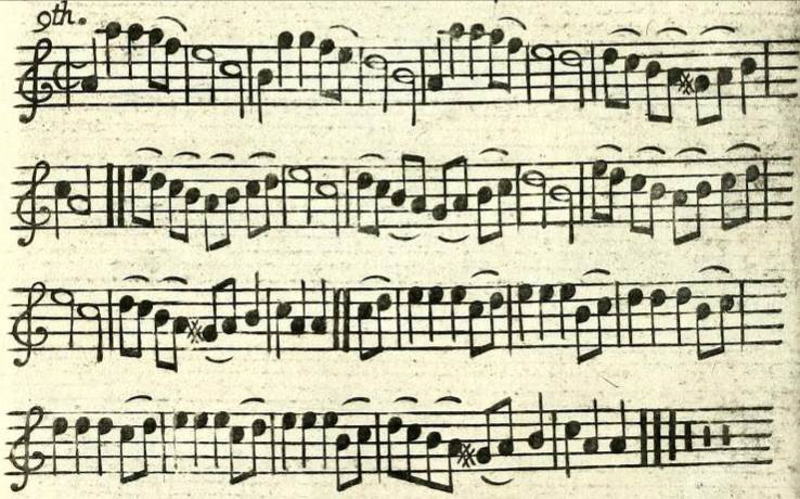 It has not been possible to source a copy of a score the Ketèlbey arrangement of Polly, however, the Gay and Pepusch 1729 publication survives, and an extract is reproduced here. The recordings present extracts from both the Austin and Ketèlbey arrangements of the air I Will Have My Humours. It is easy to see from the score extracts that the original publication only included the words and melody line, leaving much work for the arrangers to do in harmonising and orchestrating the tunes. The Ketèlbey recording is instrumental only, omitting the words. Presumably this is because much of the Austin arrangement used new words written by Clifford Bax, and of course copyright permission would be required to record and reproduce these. Grateful thanks to The Internet Archive for making the original scores available, and to albertketelbey.org.uk for making the original recordings available. (arranged from the 18th century original by Ketèlbey) © unknown. Recording by the Court Symphony Orchestra, conducted by Ketèlbey ℗ 1923 Columbia Gramophone Co.
Mr Justice Astbury admitted "I do not know much about this music . . . but I know a tune when I hear it". In other words, he felt that, although he could not read music, he would be able to tell by listening if one arrangement copied the other. He concluded that the defendants had taken a very substantial portion of the claimant's work, and that the primary object of the defendants was to make records which the public would accept as the best bits of the Kingsway production of Polly. Their work was arrived at, in the opinion of the judge, by imitation and appropriation. Judge Astbury’s summary made the important observation that “infringement of copyright in music is not a question of note-for-note comparison, but of whether the substance of the original copyright work is taken or not. It falls to be determined by the ear as well as by the eye”. He declared that originality in a musical work results “from the exercise of substantial independent skill, judgement or creative labour expended on its creation as opposed to its mere interpretation.” The Columbia arrangement was found to infringe the copyright in the Austin arrangement. The judge ordered an injunction against the infringing copies, an inquiry as to damages, and required HMV to deliver up the infringing records. An amusing footnote is a newspaper report which records that Columbia left all of their unsold records on the pavement outside of HMV's London shop. This case presented many challenges to the court. It was without precedent. The consideration was of a complex, technical musical nature, and the two works in question were long - 24 separate airs were arranged by Austin, six of them composed entirely from scratch. The recordings which formed the basis of the legal challenge ran to some 20 minutes, across four sides of two 10" 78 rpm records. In the end, though, there was plentiful evidence that the Ketèlbey arrangement must have been made after access to the earlier Austin arrangement had achieved popularity. It is of course possible for two independent arrangements of the same public domain material to bear striking similarities without one infringing the other. In my research into the music archives of Durham Cathedral I recreated a missing voice part to a choral work from the 17th century. In many places it was possible to find only one musical solution for the missing part. Adhering to the rules of 17th-century musical grammar it was inevitable that some of my results were identical to the efforts of earlier scholars Edmund Fellowes and Harold Watkins Shaw, both of whom had published equally similar editions of the same musical work. Yet, in spite of this coincidence, my solution was arrived at using my independent skill and judgement, and therefore a charge of copyright infringement in this instance would be hard to support. To give a more contemporary illustration, popular arrangements of public domain melodies include House Of The Rising Sun, by The Animals (1964), and Brown Girl In The Ring, by Boney M (1978). It would be quite possible for recordings of new arrangements to infringe these copyright arrangements by copying distinguishing copyright elements such as, in the case of The Animals, the recognisable arpeggio guitar figure, or the prominent blues organ accompaniment, and in Boney M the disco accompaniment with female vocal and steel drums. For a while it had proved difficult to source any significant detail of this case, the only contemporary law report being found in a collection of case notes by McGilvray, counsel for the claimant at this trial, reference Mag Cas 1917-23 at page 398. However, I recently discovered a rich source of information on the web site dedicated to Albert Ketèlbey, which contains full transcripts of contemporary reports from The Stage, as well as links to reports in The Times, the Musical Opinion and The Solicitor's Journal. Link to a now out of print biography of Frederic Austin by his grandson. There are also links to extracts from this book on the Ketèlbey resource above.